The conference will feature engaging and inspirational speakers with broad experience and knowledge of food, farming and pressing environmental issues including Dr. Ricardo Salvador of the Union of Concerned Scientists, Ellen Kahler of Vermont Sustainable Jobs Fund, Chef Michael Twitty of Afroculinaria and the Cooking Gene, Alex Hitt of Peregrine Farm, Glyen Holmes of the New North Florida Cooperative and other great panelists. Representative of Virginia Mennonite Retirement Community’s Farm at Willow Run. There will be three specific concurrent session tracks as part of the conference where producers and practitioners share their local and regional expertise on 1) Practical Applications of Soil and Water Health, 2) Making Money in the Middle: Finding Your Niche, and 3) Local Food for All. Additionally, there will be in-depth (3 to 6 hours) trainings on crop and whole-farm budgeting offered by Tony Kleese of Earthwise Organics and food system training on collective impact and other topics by Ellen Kahler of the Vermont Sustainable Jobs Fund. • There will be a full day pre-conference tour of local farms and agribusinesses on Tuesday, December 6 for a close-up look at and discussion with farm and food businesses in the Staunton and Greater Augusta County area. This chartered tour will offer insight to the successes and challenges by local farms and agribusinesses that are stepping outside the traditional box. Join us for an informational and fun experience! • On Wednesday evening, the Virginia Beginning Farmer & Rancher Coalition will host an informational and networking mixer. This FREE event will be off site at a restaurant in the Staunton area the evening of Dec. 7th. Look forward to friendly conversation, networking, and a chance to learn more about the Virginia Beginning Farmer and Rancher Coalition. Open to individuals looking for support in the very beginning or early stages of their farming trajectory, or seasoned producers that also want to network and mingle. Refreshments will be available from 7-9 PM. Come join the networking fun! The cost for the conference is $40 each day. The cost of the pre-conference tour is $25. • Network with other like-minded growers. • A great meal made with food from local farms. We are currently inquiring about continuing education credits for nutrient management planners and crop advisers. 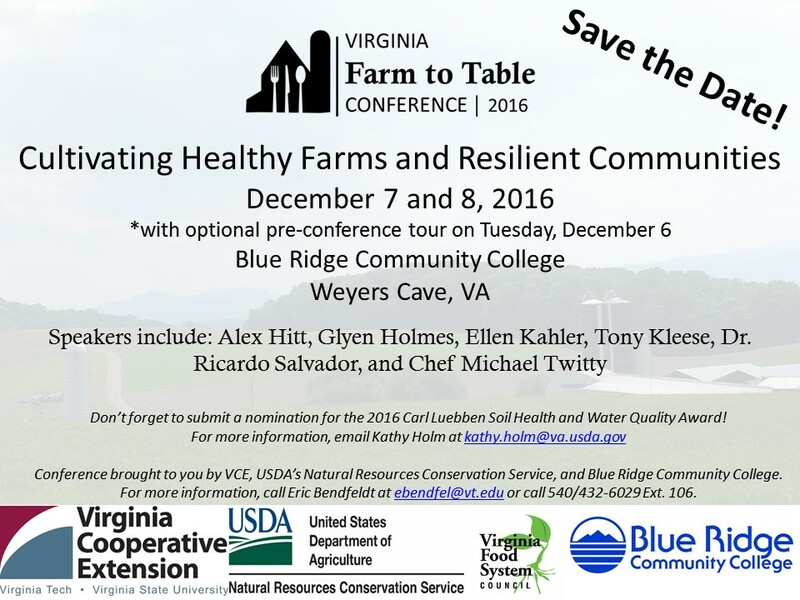 The full schedule and a link to registration will be available soon at http://conference.virginiafarmtotable.org! As a former preschool teacher, my days once were filled with small groups, read-alouds, 4-year-old conversations, and yes – even testing at that young age. However, the math skills and pre-reading skills didn’t concern me as much as my thoughts on the whole child. In my classroom and school district, like most districts across the country, this included whether they had enough to eat outside of school hours. The alphabet suddenly takes a backseat when you’re looking into the vacant stare of a child that can’t focus enough to say the letters in their name, even though you know they mastered that skill months ago. The issue of hunger across the Commonwealth and United States is startling. In 2011, statistics showed that more than 1 in every 6 children in Virginia was food insecure, meaning that they didn’t know where there next meal was coming from (1). Across the country, in 2013, 49.1 million Americans lived in food insecure households, including 33.3 million adults and 15.8 million children (2). Numbers in the millions are staggering, and can have a numbing effect in relation to personal relativity. But clearly, in my mind, no child should have to wonder about what they will eat, much less 15.8 MILLION of them across the nation. As a member of the current VALOR (Virginia Agriculture Leaders Obtaining Results) through Virginia Tech, a fellowship program designed to “develop leaders who can effectively engage all segments of Virginia’s agricultural community to create collaborative solutions and promote agriculture inside and outside of the industry (3),” our class’s last learning opportunity took place in Richmond, Virginia. We had the pleasure of meeting with Virginia’s First Lady Dorothy McAuliffe, Secretary of Agriculture and Forestry Todd Haymore, Deputy Secretary Sam Towell, and Assistant Secretary Carrie Chenery to discuss current issues in agriculture across the state. The First Lady stressed the importance of full community awareness in relation to hunger; emphasizing we need to utilize our current resources as best possible while implementing creative and necessary solutions to eliminate hunger in our communities. The staggering statistic of 15.8 million hungry children nationwide can be overwhelming, but when I bring it into the context of my community and think about what 1 in every 6 children means in my child’s kindergarten class – statistics become much more manageable. I see faces and think of families, and I am motivated to action. As a teacher, I could slip snacks into bookbags, or get a little extra food on a certain kid’s tray. Now that I am out of the school system and working with Virginia Cooperative Extension, I’m challenged by the First Lady’s message to make my work in agriculture count for my fellow Virginian’s – and especially for the children.